Machrimore01328 711653work Bed & BreakfastA warm welcome awaits you at this attractive barn conversion. A quiet location set in 1/4 acre close to the shops and picturesque harbour at Wells. Ground floor bedrooms overlook their own private garden and patio. Ample off street parking. Free wireless internet. Open all year. The Barn and outbuildings belonged to an old manor house. Our attractive gardens with mature borders, pond and water features have a lovely view across to the St Nicholas church tower. The peacefulness and serenity of our location brings our guests back year after year. We pride ourselves in our 'Aga' cooked breakfasts. We are totally flexible with our menu. All produce is locally sourced. Fresh grapefruit available daily. Sausages from Norfolk Butcher if the Year. We use chestnut mushrooms and free range eggs. Locally smoked kippers available on request. Accommodation comprises three individual colour coordinated bedrooms. We use Molton Brown toiletries. En-suite facilities include TV with Sky freeview. Wi-Fi internet access. Fridges in all rooms. A warm welcome awaits you at this attractive barn conversion. 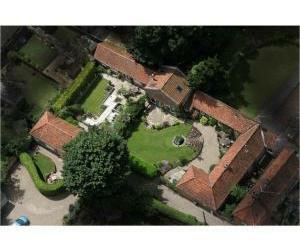 A quiet location set in 1/4 acre close to the shops and picturesque harbour at Wells. Ground floor bedrooms overlook their own private garden and patio. Ample off street parking. Free wireless internet. Open all year. We were one of three finalists in 2007, 2009 and 2012 in the Norfolk Tourism Awards. Our grading is 4 star Gold Award with Visit Britain. From Fakenham on the A148 turn left onto the B1105 to Wells. On entering Wells, turn right onto the A149. Property is on the right just before the church.